For thirty years, RAICES has been a frontline organization responding to the help families navigate a continuously changing immigration policy. Our Dallas office offers a wide variety of services. We represent unaccompanied children and their families in court. We also help our clients file for asylum and renew their DACA status. We regularly host Know Your Rights and DACA workshops that help migrants and citizens learn more about the immigration process. RAICES provides representation for detained mothers, fathers, children and unaccompanied minors in family detention centers across Texas. We help women prepare for immigration court by prepping them before their meeting with their asylum officer by helping them fill out applications and practice their asylum interviews. Since January of 2017, RAICES staff and pro-bonos provided representation to 90% of women at the South Texas Detention Complex. RAICES is one of the largest providers of services to minors in ORR shelters. RAICES also provides service to new and temporary locations such as Lackland Air Force Base Emergency Shelter in 2014 and at Fort Bliss in 2016. Through the RAICES RCIS program we support and provides representation to uniquely vulnerable populations including medically fragile children and survivors of domestic violence. In 2017, RAICES staff closed 51,000 cases at no cost to the client. Our advocacy and commitment are driven by the clients and families we serve every day. Our attorneys and legal assistants provide legal advocacy and representation in an immigration system that breaks families apart and leaves millions without a pathway to legal status. RAICES offers free and low-cost consultations for community members and full representation for those who qualify at all our office locations. We educate and support immigrants as they make our communities their new home. 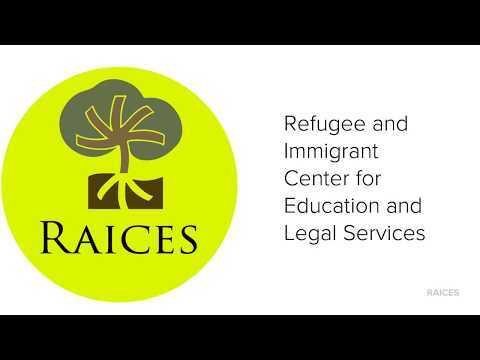 As a newly designated ORR Refugee Resettlement Agency, RAICES receives refugees and provides case management and support. Our Refugee Assistance Program hotline connects refugees and asylum seekers to supportive people in their communities to provide assistance for their legal process, enrolling children in school and accessing community resources. We close the gap between state-level frontline practitioners and federal-level policy makers. We hold local, state and national leaders accountable for the just and equitable implementation and administration of laws, policies and practices that impact the immigrants along with the marginalized communities that we serve. We provide direct support to communities as they develop internal leadership for building community power.